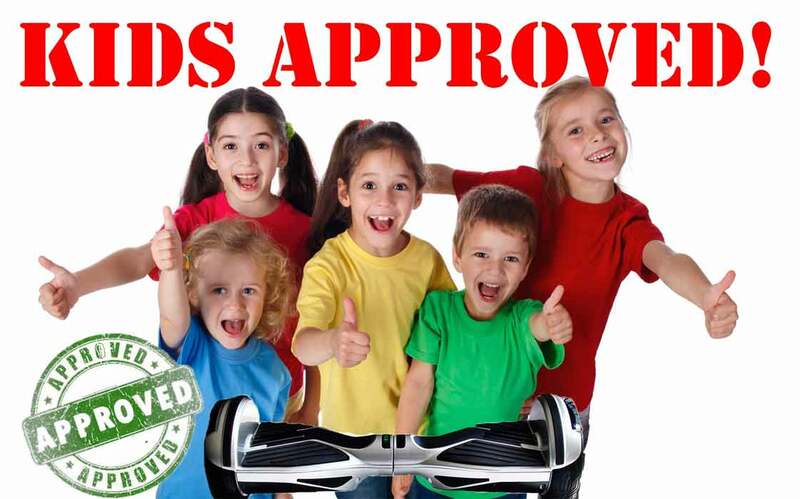 Looking to buy a hoverboard for your kids? As a parent with 3 kids of my own, I know that their safety is the most important thing in the world. I also know what works and what doesn’t. So in this article, I have handpicked the best hoverboards that cater to kids out of a safety perspective. 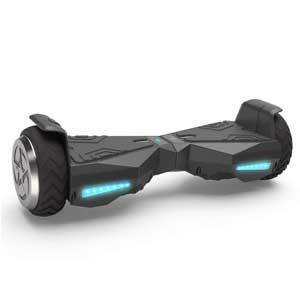 All the models that you can find in our top-list below have gone through the safety test UL 2272 certificate specifically made for hoverboards and other electric transportation vehicles. In order to assure you that this is a somewhat impartial review, I want to be transparent that I own a hoverboard brand in Sweden and I am proud to say we are the only one passing the UL 2272 in Sweden to date. I also hope this assures you that we have the knowledge needed to help find you that perfect hoverboard gift for your kid. With that said let’s jump straight to the head to head comparison below. These are the most appreciated hoverboards among both kids and teenagers and they have all received highly rated reviews by their former customers. Kids often talk to each other and if one of their friends has a specific hoverboard model there is a good chance that your kid wants the exact same one. But that one might not be a good fit depending on your kids skill-level and age. In order to help you find a hoverboard that will suit your kids the best, here are our top 10 reviews. Tomoloo has a bunch of cool looking models and my favorite is the Q2C. The Q2C has flashing RGB lights on its wheels and speakers from where you can play your favorite songs through Bluetooth. They have been in business for quite some time and their hoverboards quickly became popular as one of the safest choices for kids. It has the standard 6.5” size on its wheels and they are made out of hard rubber so you do not have to worry about getting a flat. They offer a good 12-month warranty that covers any factory problems. It is powered by 2 x 250W motors that will have no problem propelling your little one up to 7.5 mph and conquering inclines up to 15°. The 25.2V 4Ah will provide you with at least 2-3 hours of fun before you have to recharge it. Recharge time lands on about 2 hours from empty to full. If you’re interested in checking these high-quality boards out you can find them on Amazon or read our full Tomoloo review where we compare the different models to each other. We recommend the Tomoloo Q2C to kids age 5+. Read more about the models from Tomoloo in our comparing review. 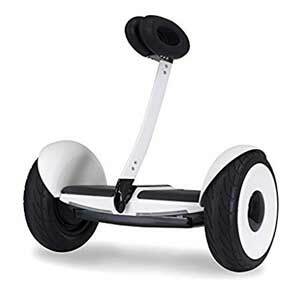 Probably the safest pick available for your teenagers would be the Segway MiniPro. A great hoverboard look-a-like that doesn’t really work like a normal hoverboard. The main difference is that it is much larger, which also means that it is much heavier. This might not be optimal for the younger riders but for a teen, it’s a really good choice. Instead of them twisting the middle like on a normal hoverboard, with the MiniPro they get to use the stick in between their legs to maneuver. It takes some getting used to, especially if you’re used to one of the standard models like I am. But it’s actually a really comfortable way to ride. The stick also increases your stability. Another difference is that it possesses the most sophisticated technology right now. They will be able to control it with their phone and use all its features though it. The MiniPro also has this function where it doesn’t let the user go above a certain speed in order to ensure there are no accidents. It is very powerful and it doesn’t just hold your speed back it kinda brakes when you reach a certain speed. A bit annoying at first but when you learn the limitations you won’t notice it. The 10.5” pneumatic tires also boast two 400W motors. One on each side powered by a 310Wh battery giving it a good 10 mph top speed and a very good 14 miles per charge. The best part is its mobile application that allows them to remotely control the unit, check diagnostics, firmware update, customize its lights, adjust speed, and turn on the anti-theft alarm. We recommend the MiniPro to teenagers 12+. For full specification read our Minipro review. The Gyroor warrior comes with two very powerful motors of 350W each. This gives it one of the best torque on the market for its size. It has puncture-free solid rubber 8.5-inch off-road tires that provide excellent grip on even the most unforgiving terrain. The Gyroor warrior has two 4.1 stereo built-in speakers and can easily be connected to via Bluetooth in order to play music and use the mobile app, on which you can adjust torque, top speed and many other things in order to personalize it to you or your kid’s age and experience level. It delivers a top speed of up to 9.5 mph and you can ride it for about 7-9 miles on a single charge, depending on the user’s weight, terrain and riding style. If it runs dry you can have it charged again in 1.5 to 2 hours which is very fast. Riding on various terrain and perhaps on a dirt track you might want the ability to conquer steep hills too, don’t worry the Gyroor warrior takes you up even really steep hills at 30°. A really good model, if you’re a kid looking to hit some grass or dirt. However, don’t expect to ride this thing on loose gravel as it will dig itself down and sink. 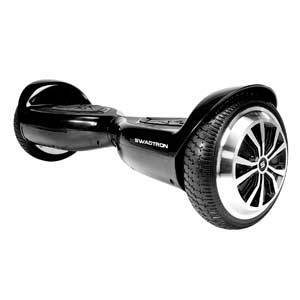 If there are lots of loose gravel roads where you live your only option is to opt-in for a 10” hoverboard instead. We recommend the Warrior to kids 7+. The 4.5-inch hoverboard from CHO doesn’t have the same amount of power as those mentioned above but it has one type of user in mind and that is kids only. You heard it right, this hoverboard was built to only be used for kids or should I say users up to 120 lbs. It delivers a moderate 4-6 mph top speed and a distance of about 3-6 miles on a single charge depending on where and how you ride. There are no extra functions on this model as it is meant to be a basic beginners board for those really young users 3-7 years old. The best part about it having fewer features is the price. Gone are the days where you had to pay a month’s mortgage to get a hoverboard. This one comes in at just about a hundred bucks which is a more than fair price I would say. It is safe and easy to use. 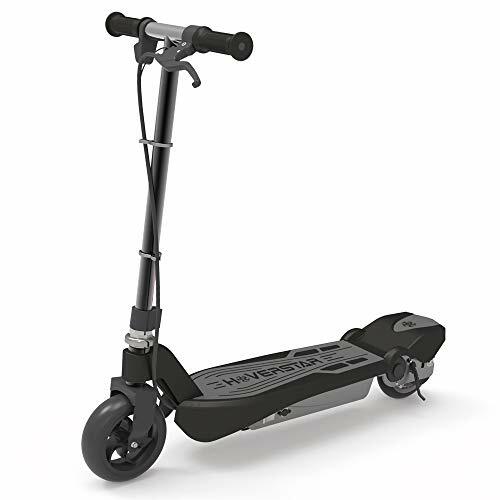 Since it is riding lower to the ground you get a bit less ground clearance but it makes it much easier for those small legs to mount and dismount the hoverboard. It has some good lights that make you more visible even later in the day and it takes about 3-4 hours to get it fully charged when you’ve drained the battery completely. A solid choice for parents with kids around 3 to 7 years where a normal hoverboard might give them too much power underneath their feet. Let your heart take a rest while CHO 4.5” provides your kids with a fun and safe hoverboard ride, just like the older kids. We recommend the Cho 4.5” to kids age 3-7. Hoverstar is an up and coming brand in the hoverboard market. 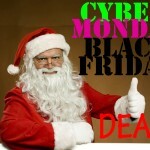 Their prices in combination with the service and quality are what makes them so popular. This 6.5” hoverboard from Hoverstar is no exception. You don’t have to worry about breaking the bank here. It provides you with a new and very unique design that has wide foot pedals that provides great grip and stability. It is powered by a 24V/3.2Ah lead-acid battery which is a bit less powerful and needs a bit more time for a full recharge, 3-6 hours to be exact. But they are much less expensive and safer to use. This gives the 200W x 2 motors a top speed of 10 mph and a maximum distance of about 8 miles on a single charge. 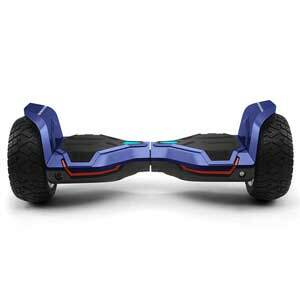 It is very easy to ride and it can cater to users up to a 180 lbs. If you’re on a tight budget and don’t mind the longer recharge time then this is a solid choice for your kids. We recommend the Hoverstar to kids age 5+. The Sports edition from EpikGo blew my mind and with unique design, the high top speed, durable frame and long distance you can almost never go wrong. Stronger motors of 400w and a fast charging system of 2 hours let you ride rougher terrain, faster and farther. The design is similar to the Halorover except for the set of wheels which has been specially produced in order to give the user higher torque and less resistance when riding on even surfaces. I love going off-road, but when I want to hit the streets the EpikGo sport is my first choice. A reliable hoverboard with optimized street performance and a really cool and stable design. I highly recommend it to any teenager who will be mostly be riding in the city and on even terrain. The off-road version is just as fun. It can be used on most terrain with ease but if you have some dirt paths, gravel or perhaps even a dirt track near your home then the off-road version is definitely a must. We have compared both the Sport and off-road version head to head and it really comes down to where you want to ride. Both models come with a mobile application in which you can adjust torque, max speed and the sensitivity of the sensors. You can also keep track of your route, how far you’ve driven and how much battery juice you got left. They have a set of bright Led-lights both front and rear that makes you more visible to others around you while giving you a clear view of your surroundings. It is a bit expensive though. We recommend the Epikgo to kids age 8+. Razor is well known in the electric transportation/toys genre. We know what type of quality to expect when buying one of their products and as with most Razor products the Hovertrax 2.0 lives up to their standards too. 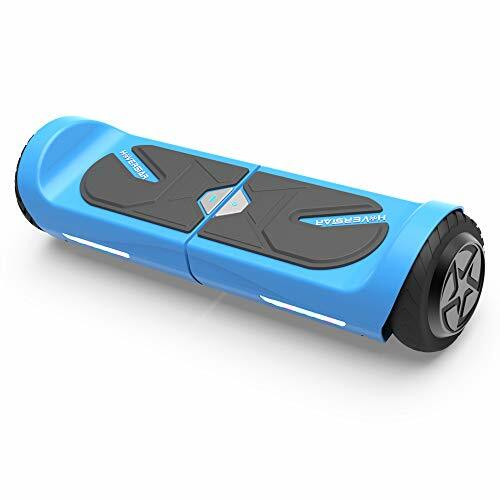 Combined with their service minded support who have good knowledge about the product this makes for a great hoverboard for kids. Razor has introduced a new technology called EverBalance which makes it super user-friendly. It basically means that even if you do not press the pressure pads it will stay in balance without tipping over. This makes it much easier for a kid to mount/dismount the hoverboard and you won’t have to worry about scratches when dismounting. 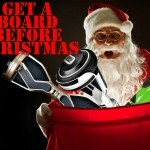 Therefore, it is one that we highly recommend to parents with younger kids who are looking for their first hoverboard. We recommend the Hovertrax 2.0 to kids age 5-14. If you want more information about the Hovertrax 2.0 check out our full review. 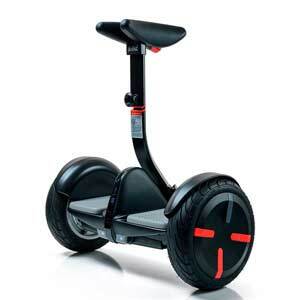 The new Segway MiniLite is here is just like a Segway MiniPro but cheaper and child-friendlier than ever. A premium hoverboard experience that works perfectly for both kids and adults. Just like the MiniPro you turn with your knees instead of twisting the middle like on most of the standard hoverboards. You get something out of the ordinary. 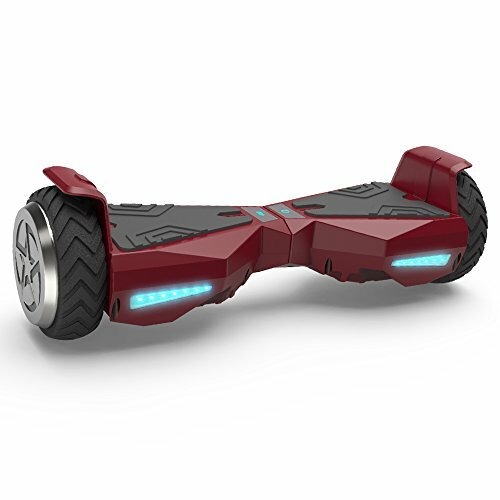 A safe, powerful and feature-packed hoverboard for a great price. The quality can be assured just by hearing the name Segway who have been in this business the longest, constantly pushing limits and creating new models. We recommend the Minilite to kids age 7-16. The most popular model from Swagtron right now is the Swagtron T580. 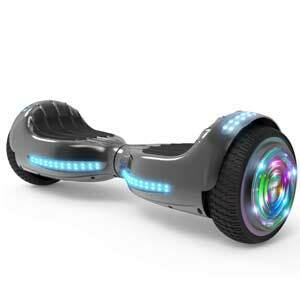 It has a decent speed of 8 mph and a distance of around 11 miles on a single charge. What makes it so popular among the hoverboard community is the combination of low price and good specs. The ride itself is smooth and it is very easy to learn, this is mostly thanks to the two different user modes you can choose between. They were the first ones to introduce a UL 2271 sentry shield battery into hoverboards and also the leaders with being the first ever UL 2272 certified hoverboard. This gave them a trusted fan base and loyal customers who know that they get what they pay for. Unfortunately, their customer support has lately been known to have its flaws and you should know this beforehand if you need support for any reason after you’ve made a purchase. We recommend the T580 to kids age 6-14. Hoverheart has been selling hoverboards for years now and is one of the most price-worthy options you can go with. If the Hoverstar ABove doesn’t float your boat you should definitely have a look at Hoverhearts 6.5” as a viable option. With a top speed of 6 mph, it is perfect for our younger audience who are yet experienced enough to drive really fast. It can take you for a ride of up to 10 miles and it has two strong 250W motors that are more than capable of accommodating adults of up to 220 lbs too. So even if you’re buying one for your kid. You will have the option to ride yourself one day. 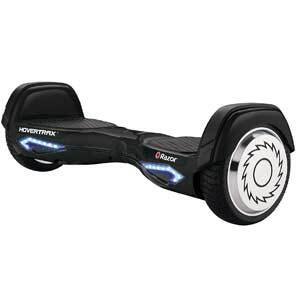 It comes with the same futuristic LED lights as seen on many other models that flash in various colors while you ride. It also has the standard LED lights that give you better vision during the darker hours of the day. Perfect if you want a cool looking disco unit for your kid that doesn’t cost you a fortune. A reliable hoverboard with good performance and some neat features for almost nothing. We recommend the Hoverheart to kids age 6+. 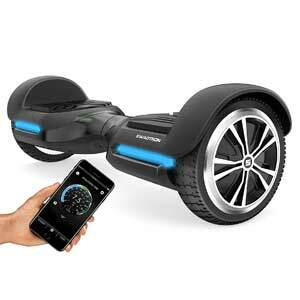 The Swagtron t5 is an entry level beginner friendly hoverboard. Its small size makes it easy to carry, even for its youngest users. Even though the T5 doesn’t have the same specs as the T1 or T3 it might be a good fit for beginners providing everything in moderation. 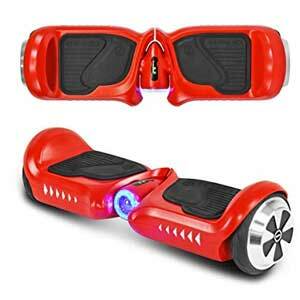 It is an affordable option at around 50$ less than the Swagtron T1 which is one of the most popular models. It has all the safety measurements and features that you might look for in a beginner board but I’m afraid that older kids and teenagers might get bored with it pretty soon. With that in mind, we recommend it to the youngest of our audience where the lower speed might actually be a positive thing. For more advanced users, however, I do recommend the T1. While most new kid toys these days come in the form of a small plastic box with a touch-screen, a hoverboard lets them enjoy the outdoors a bit more for once. The use of a hoverboard are endless and here are but a few of the benefits of owning one. Getting some fresh air. You get them to leave the screen for a while and go enjoy the fresh outdoor air. Today hoverboards are just as safe as any other electric product your kids use, if not safer. Getting back and forth to school has never been as fun and easy. Some models can be used on various terrain, hence they can take it with them on various family activities. The whole family can actually the same model. Even though we recommend a model for kids, that doesn’t mean that parents can’t enjoy it too. Extending their freedom, just like when you learned how to ride a bike or when you got your driver’s license. Kind to the environment, it helps reduce the emission of co2 by reducing you and your child’s carbon footprint. Easy to learn, my personal experience from learning kids how to ride is that it takes never takes more than 30 minutes to an hour before they are comfortable enough to hit the pavement. Everyone can learn, my boys learned how to ride a hoverboard at 3 and 4 years old. Now they roam the yard freely, at low speed of course. 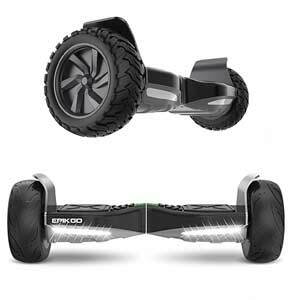 Looking to find the perfect hoverboard gift for your kids? All kids are different and no matter what age they are they do all have different learning curves. Some might learn how to ride a hoverboard in an hour and be very good at it. And some may need a bit more time before getting comfortable enough to go outdoors to ride, it all depends on the initial skill level. There are some things you should ask yourself before making the final choice of which model might fit their needs the best. Consider their age – All kids are different and younger ones might need a bit more time to adapt to how a hoverboard operate. A comfortable ride comes when they finally learn to trust the hoverboard and relax their body. Weight limitation – For kids, the maximum weight is rarely a problem. There is, however, a minimum weight recommendation of 30lbs for 6.5” and 8.5”, and about 40lbs for the 10” with pneumatic tires. Safety gear – Be sure that you put safety first. Get a reliable helmet and knee/elbow pads and also make sure that you pick a UL 2272 certified board. Safe model – Make sure the hoverboard you are looking at has the appropriate safety features such as the option to change user level settings. Bluetooth is good if your kid would like to listen to music while riding. Using headphones is not recommended, you do not hear the warning beep when you’ve met the top speed. Something I learned the hard way. What size should you choose – The size you should choose often boils down to personal preference and of course the age and where your kid will be riding. 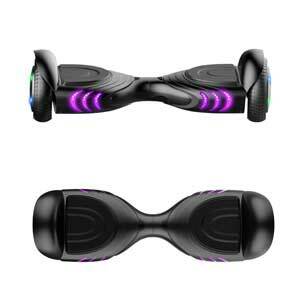 4.5” is for the youngsters in the family while a 6.5” hoverboard will do great on hard surfaces for kids of all ages. If there are dirt roads or roads with uneven points you might want to opt for an 8.5” off-road model as it will give them more ground clearance and better grip. My hope is that you have already found a hoverboard that will fill the needs of your child. If not, don’t worry. I’ll be going over the top choices for you again here in a short recap. What you want to be sure of is that the model you choose has the latest safety features like fireproof plastic and protection against overcharging. Don’t worry, the models in our list all have UL2272 certification. This is an indication that they have gone through the latest safety test here in the US. Overall best and most price-worthy hoverboard would be the Tomoloo Q2C. It has everything most kids would want, from great lightning features to good speed and riding distance per charge. All this from a trusted and reputable brand within the industry. If you want an all-terrain hoverboard for your kid I would put my money on the Gyroor Warrior. Very fairly priced and it has a lot of cool functions including very reliable and powerful motors that will have no problem at all handling some rough off-road riding. For bargain hunters there are two choices, either go with the Hoverstar or the Hoverheart hoverboard. Both models are good, the difference is that the Hoverheart model as a few more features to it. For the small toddlers, I suggest having a look at one of the 4.5” hoverboards, like this 4.5-inch from Hoverstar. These are built with really young children in mind and have a much slower speed and acceleration making them a really good choice for families with kids around 3-7 years old. After reading through our guide on what’s important when looking at hoverboards to buy for your kid I hope that you now feel adequate enough to make a solid and safe choice that will bring you and your kids joy for years to come.